World Class Fabrication. Global Reach. 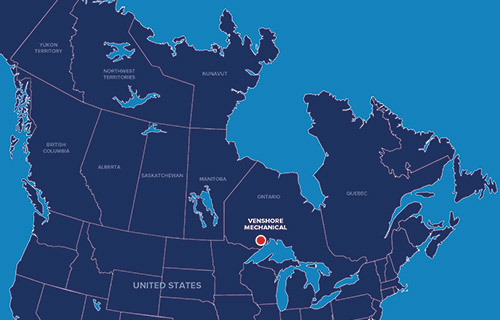 Venshore Mechanical is strategically positioned at the centre of North America, with immediate access to all modes of international transportation systems. Venshore Mechanical has direct access to CN and CP rail lines, providing heavy shipment abilities across Canada and the United States. Venshore Mechanical's operations lie at the mid-point of the Trans-Canada Highway, We also have direct access to the United States Interstate Highway System and the proposed SuperCorridor System via Highway 61. Boasting one of Canada's largest warehousing and transhipment complexes, The Port of Thunder Bay provides Venshore Mechanical with ready access to the Great Lakes St. Lawrence Seaway System, and the world. These connections allow us to deliver deliver piping, skids, spools, and modules to anywhere across Canada, the United States, and the world, quickly and easily.